This paper, refereed and published by the W.E. 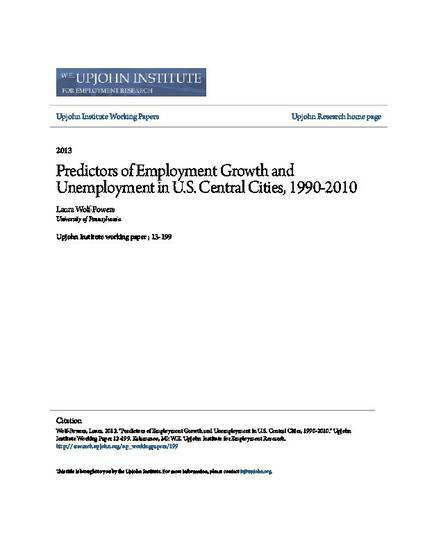 Upjohn Institute for Employment Policy, considers employment growth and unemployment from 1990-2010 in a cross-section of cities in light of practical tools that city governments have at their disposal to provide relief. In particular, I test educational attainment (both initial levels and growth over time) and public capital investment as influences on job growth and changes in unemployment rates in 83 central cities in the United States. Change in educational attainment over time is suggestive of causing higher job growth and lower unemployment. The implication is that initiatives to attract and retain college-educated professionals and investments in increasing college attainment among incumbent residents have the potential to reduce joblessness and improve social welfare. Despite some evidence that public capital outlays led to employment growth and reduced unemployment n the 1990s, the overall association between capital outlays and labor market health is weak. Intergovernmental spending as part of the American Recovery and Reinvestment Act (ARRA), however, was found to have a positive effect on unemployment rates in 2009 and 2010. A relatively weak correlation between the two dependent variables used in the analysis— employment growth and unemployment rates—underscores the mitigating roles of migration and labor force participation in translating job creation into employment growth for members of the unemployed population.